Venice is seeking to rival Milan's annual design fair, the Salone, above. Is Italy returning to medieval-era warfare between city-states Milan and Venice? AN’s own Julie V. Iovine reports from Milan that Milanese and Lombardy officials are more than a bit miffed that Venice is proposing to start its own design fair in 2011, seeking to steal the spotlight from the nation’s long-established epicenter of design. 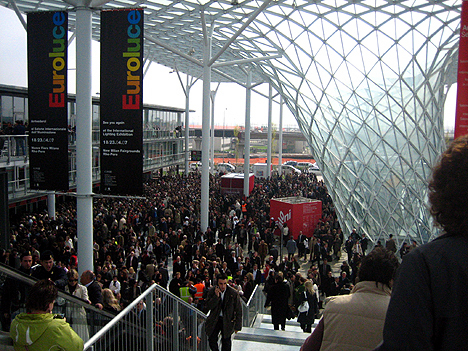 The annual Milan event attracts more than 300,000 visitors and brings in, according to Italian newspaper Corriere della Sera, at least 7 million euros a year for the local Lombardy economy. Siphoning some of that wealth into Venetian coffers would be a blow to both the Milanese pocketbook and to its powerful design community. Venetian officials are said to be giving a serious look to the proposal, which would add another high-style biennale to its roster of well-known art and architecture events. Whether the dueling design capitals can reach a peace accord over the matter remains to be seen.